This is by far my favorite Solidworks feature that no one seems to use or even know about. It’s called “move with triad” and it makes working with assemblies much easier. Right click on any part in an assembly and it should be an available option. The triad tool allows you to constrain part translation or rotation to a single axis. This removes a lot of frustration when positioning parts in an assembly prior to mating them. The flexibility to position things easily can really speed up machine layout and concepting when things are loosely defined. The triad can also help you locate parts lost in larger assemblies or move parts that have gotten lost inside other solids. Bind it to your “T” key now! Over the years I have used most of the available solid modeling packages for machine design and part detailing. Autodesk Inventor, PRO/E, CATIA, and Solidworks. I tried Sketch Up once and considered it an abomination – it is in a strange uncanny valley between engineering and consumer uses. Inventor and Solidworks are extremely similar in appearance and function but Solidworks is by far the package I have used the most. It is my current favorite (having learned all of the its idiosyncrasies) and has a nice blend of usability and performance. I have easily surpassed the 10,000 hour mark but still have much to learn. That being said I have learned a few tips and tricks over the years and plan to share them here. 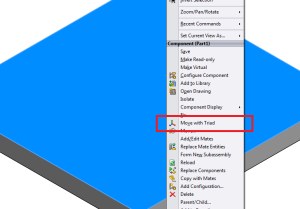 Stay tuned for some Solidworks specific posts.